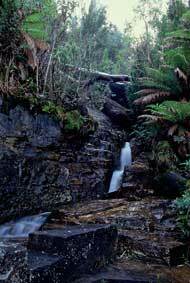 By NICK OSBORNE | A popular walk winding through the foothills of Mount Wellington, the Pipeline Track has historical significance as well as great scenic beauty. For more than a century it played a major part in the supply of water to Hobart. When Lieutenant Collins founded the settlement of Hobart Town in 1804, one of the major considerations was the fresh and adequate supply of water, because Tasmania's original settlement at Risdon Cove had failed for just this reason. The Hobart Town Creek, later to be known as the Hobart Rivulet, appeared to satisfy this essential need, but by 1828 the government officially recognised that wastes from a variety of industrial, agricultural and human sources were polluting the water, and that during the late summer months the flow of the rivulet was sometimes reduced to a trickle. Accordingly a brick conduit, called the town tunnel, was built from the Cascades (around four kilometres upstream from Sullivans Cove) to a large reservoir at the Barracks. Completed by 1831 it actually had the effect of increasing water consumption, as piping from the Barracks soon networked throughout the township. 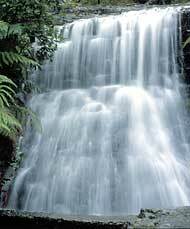 Extra water was drawn from the upper catchments of Browns River and Fork Creek and fed into the Hobart Rivulet via interception pits and a deviation channel along the south-eastern face of Mount Wellington. Today part of the channelling is still visible and follows the course of Mills Track above The Springs on the road to the Pinnacle. But demand for water continued to increase. In 1858 it was recommended that a large reservoir or series of reservoirs be constructed on the Sandy Bay Rivulet, capable of holding four months' supply, without any inflow, for 30,000 inhabitants. Because of slippage and seepage problems the task took from 1861 to 1895, but in that latter year two reservoirs with a capacity of 500 million litres were completed. Today, these reservoirs form part of what is known as Waterworks Reserve, a popular picnic and barbecue area. The original supply of water to the Waterworks reservoirs was from Fork Creek, captured by a circular masonry intake known as the Wishing Well. 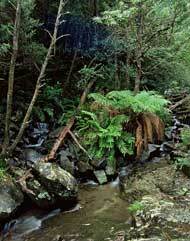 Wooden troughs transferred this water to a second intake at Browns River called the Ferntree Bower. From here, water moved along masonry and timber ducts to a receiving house that stands to this day and is still in use, as a shelter at the Waterworks Reserve. St Crispins Well intake, at the rear of Mount Wellington, was connected to the Wishing Well in 1875.